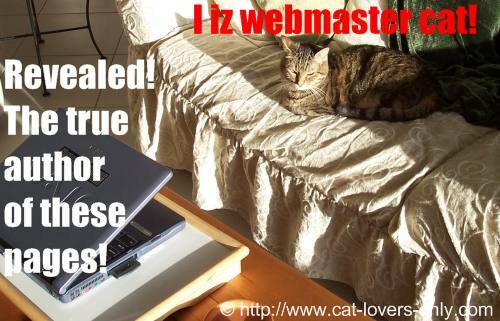 About Cat Lovers Only: The Web Site For Cat Lovers! Here's some information about Cat Lovers Only to give you just a little insight into the "behind the scenes" of the web site and its author. Very obviously, this web site is all about information on cats, and little else. Oh, and hi! And thanks for visiting! My name is Kurt, and I am the publisher of Cat Lovers Only. As you can probably tell, I have a strong passion for cats. No kidding, right? I also consider myself to be the cat lover's cat lover! For more than 12 years, my cats have been valued members of my family. Confession time: from the time I was very young, I have always been fascinated by cats. Cats were not always in my life, however. I grew up with a dog, as well as a few other pets. It wasn't until I was an adult that I developed a deep relationship with a kitty. After I met Priscilla... I was hooked! When Teddie and Frankie came along, forget it. I was done (as if I wasn't already with just Priscilla). These three very special cats awakened the true cat lover in me. I hope you enjoy my site and find it useful. Above is a picture of my oldest cat, Priscilla (the queen). She is claiming to be the real author of these web pages. I will not argue with her since she is always right. You can read more about my cats here, and see some more funny cat pictures here. 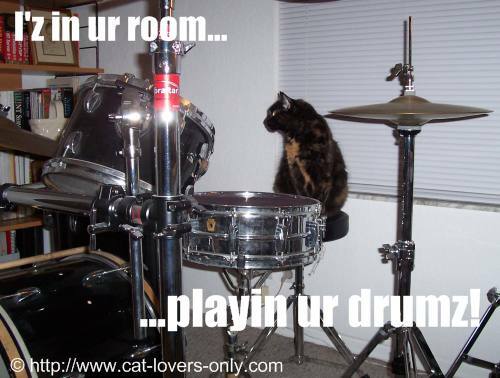 Frankie (above) is playing my drums, and Teddie (below) is Basket Cat! On a more serious note, please make sure that you verify any information you get about cats from any source. 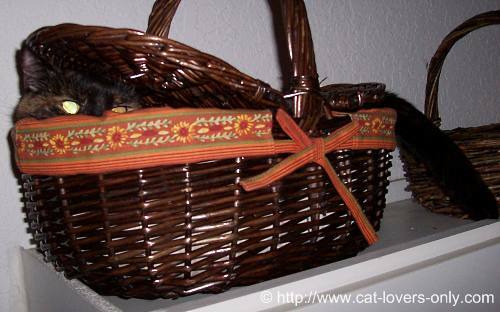 Often, the situation with your cat will be slightly different from others. Your best source of information is your veterinarian, and you should always contact the vet with questions or concerns about your cat. The above seems obvious, but I have actually had people email me about emergencies with cats. I cannot dispense medical advice about your cat and if you've got an emergency, please take your cat to a veterinarian immediately. or, confirmation of something that you thought you knew about cats but weren't sure. I've found it somewhat frustrating that there seems to be so much conflicting information regarding the care of cats, and their health and behavior. Unfortunately, veterinarians are very busy people, and we often don't know what questions to ask. It's difficult to sort it all out. With that in mind, I usually try to give you more than one point of view on a topic. I've also tried to give you enough background information and references so that you can determine which point of view, if any, applies to your situation. I realize that your cat knows the answer to any question you may have, but she won't tell you! Some of these questions are asked daily, and it's much easier on my carpal tunnel syndrome and much faster if I answer them once in this frequently asked questions section. Can you post my personal fund raiser on your Facebook page/website/etc. and ask your social media followers/email subscribers/site visitors/etc. to donate? I'm always sorry to hear about bad situations with cats, people, or any other animal. Unfortunately, I can't post personal fund raisers without fully vetting them, and I don't have the staff to investigate the hundreds of requests I get for this type of post. Because there are so many, I'd also need to run a separate Facebook page or website dedicated to just posting these types of posts. It would be more than a full-time job. My best advice is to find out which local news reporter in your area covers human interest and/or pet stories and get them to tell your story on the local television news, or in the local paper. I see this here locally all the time, and they often direct their viewers and readers to the fund raiser link. Some of these stories even go viral and get lots of attention. Note: If you're a rescue, please check this page to see if you can create a listing. I can't afford vet care for my cat, and I don't want to do a fund raiser, what else can I do? Many of us have had a losing battle with finances, and an unexpected vet bill can be a real thorn in the side. For those times, you can either finance your vet costs (if you need credit, you can apply for CareCredit), find a vet that accepts a payment plan, or work hard to find more money. There are entire websites and books devoted to personal finance, how to find lost money, save money, earn more money, and so on (The Penny Hoarder comes to mind). This site isn't about finances, but I've posted some ideas on how to finance veterinary care costs and some creative ways to pay for the cost of vet care. How do I get my cat's picture featured on your site/Facebook page/etc.? Thousands of cat lovers would love to see your babies. As of this writing, there are a couple of ways to share your cat pictures and stories with your fellow cat loving readers. Way 1. Post your photo to the Facebook page. Some of these photos will be re-posted to the Facebook page and/or to the website, and may be shared on other sites/social media channels. Way 2. Post your photo and story using the form on this page. These will be posted to the website and may be shared on other sites/social media channels. Note: Depending on the volume of photos, it can take some time before your photo is posted, and not all photos are posted. To increase your chances of having your photo posted, only post high resolution photos, and tell us something about your cat or the photo. How do I get my story/picture into one of your books? For a chance to be in one of my upcoming books, join our email list and wait for the next announcement. I've heard you give away cool prizes like cat t-shirts and cat toys. How do I enter one of your contests? Join our cat club or Like us on Facebook.